Nice places to listen to chamber music at lunchtime in London. In a previous post I noted that it’s possible to listen to chamber music at lunchtime almost every day (except Saturday) in London. Here’s a short overview of each of the locations for those that might want to give them a try. I include a bit of history, the type of music, the general comfort, and places to have lunch afterwards. The doyenne of this list, the Wigmore is one of the world’s greatest chamber venues. 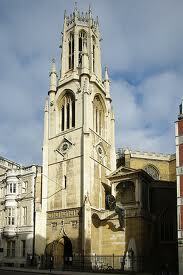 It’s located in Wigmore Street, behind Oxford street, and round the corner from John Lewis and Oxford Circus tube. Built at the turn of the 19th century as a display hall for Bechstein pianos, it has almost perfect acoustics, driven by the long thin hall and the cupola behind the stage. Seating is quite comfortable, except for the tall for whom there is minimal legroom, and accoustically there is not a bad seat in the house. The artist roster is always world-class, and performances range from sonatas to octets. Most of the concerts are in the evening, but on Mondays in season they run a lunchtime concert, recorded live by the BBC for a bargain price (given the quality of the artists) of £12. In addition on Sundays, they run a ‘coffee concert’ also for £12 which includes a glass of sheery, juice or coffee at the end of the programme. This is a terrific place for chamber concerts – with the only downside being the extreme popularity of the venue, requiring booking fairly well in advance (about 1 week minimum), and discouraging spur-of-the-moment listening. Eating nearby offers many choices, (unsurprisingly given the location). If in a hurry, or feeling cheap, I use the Comptoir Libanaise, farther along Wigmore Street, but for more sophisticated tucker, I suggest the excellent tapas at Providores in Marylebone High Street, the useful set lunch at L’Autre Pied, or the excellent modern Indian tapas at Trishna, both on Blandford street. 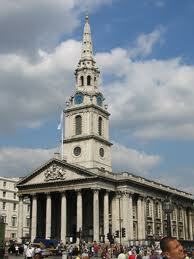 Blessed with a fabulous location on the east side of Trafalgar Square, there has been a church on this site since 1222. The present church was designed by James Gibbs and completed in 1726. Handel and possibly even Mozart both played on the Schreider organ of 1727; and the Academy of St Martin in the Fields was founded here in the 1950’s by Sir Neville Marriner. The lunchtime concerts were first held in the National Gallery as a morale-booster in the Blitz, and continued in St Martins when the war ended. The tradition is thus very rich and this is deservedly the most famous and popular of the Church-based chamber music venues. The accoustics are excellent, and the church layout means that it is possible to sit within a few feet of the players – it’s necessary to arrive 30 minutes before to get a good seat though. The pews are of course rock-hard – a ConcertCushion is advised – but legroom is fine, even for the tall. The concerts are ‘free’ (though a £3.50 contribution is requested), and this pushes the artist roster towards the very young, the upcoming, or talented amateurs of all ages. I have never heard a bad concert here, and some have been genuinely moving, but don’t expect to see world-class stars. The area provides many opportunities for lunch – the closest and best (if you have not eaten there before) is the excellent French wine bar/small plate restaurant, Terroirs at 5 William IV Street, 100 yards from the church. Just up the same road is the impressive Les Deux Salons , purveyor of a fine £15 set lunch. For a cheaper and faster meal, I am currently very partial to the Mexican streetfood of Benito’s Hat at 19 New Row, on the right off St Martin’s Lane, while in my view the best value high end lunch in town is to be had a little further towards Covent Garden at Clos Maggiore (again French) where three courses and a half bottle of wine can be had in very attractive surroundings for £19.50 (which you will end up exceeding in all the other places I have mentioned with the exception of Benitos). And on the subject of St Martins, it’s worth mentioning that just up Charing Cross Road is the wonderful National Portrait museum – a little gem that is always worth visiting, and the perfect end to a day of listening, lunching and generally appreciating things of beauty. This lovely church on Picadilly, just along from Eros, is actually older than the current St Martin-in-the-fields, and was designed by Wren, being consecrated in 1684. Despite it’s rather dark and forbidding exterior, it has a beautifully light and spacious interior and again excellent accoustics. For some reason it is not as popular as St Martins, and as result good (but hard) seats can be obtained without having to arrive early. The artist roster, however, is excellent – probably the best of any of the church venues. It is used more or less as a live rehearsal opportunity for really good chamber groups, and also an opportunity for former stars and orchestral alumnae who for various reasons are returning to the concert scene. Another source of programming is the excellently-named Anglo-Japanese Society of Wessex (sister organisation to the AJS of Nossex, which, sadly was swept away by the flood). Another benefit of this venue is the very fine Fazioli grand piano, which to my ear has easily the same quality of tone as St Martin’s Steinway. Eating opportunities are more Italian based this time, with my first choice being the Involtini at the excellent Polpo in Beak Street, or if that is full, the same at Bocca de Lupo on Archer Street. 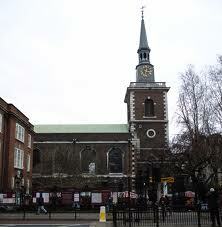 There has been a church on this site since around 1000AD, although the current building has only been here since 1831. Located on Fleet street, about 200 yards past the Law Courts it is an unusual building, Gothic on the outside, and octagonal on the inside. It is extremely quiet, financial types evidently not being great concert goers, but comfortable, with nice plush seat cushions. Unusually, eating your lunch while listening to the concert is not only allowed, but encouraged. The artists are surprisingly high quality, as they are supported by the excellent Anglo-Japanese Society of Wessex, although they struggle somewhat with the antiquated church baby grand. Fleet Street is a desert for food – it’s not worth looking for anything other than pubs, so I suggest heading back to the West End to eat at the recommendations above. Little known fact: There is a St Dunstans-in-the-East between Monument and Tower Hill tubes. Now a ruin, the Church stood from the 1100s, with a tower subsequently built by Wren until partially destroyed in the Blitz. There is also the famous St Dunstans college and church in Dulwich, in the South. Of St Dunstans-in-the-North we know little. We must assume that it was in Nossex, and therefore swept away in the flood. Often cited as the most distinguished of Wren’s churches, this location on Cheapside has been a site of Christian worship since 1080. 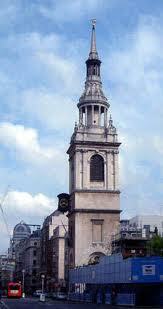 It is probably best known as the church of “Bow bells”. The nine o’clock Bow bell not only marked the evening curfew but also the end of an apprentice’s working day, and rang from the mid 1400s to 1876. It became the most famous bell in London (and at that time, the world), and the legend was born that only those born within earshot of the bells are in were entitled to call themselves Cockneys. The church now runs lunchtime concerts on Thursdays. I have not yet visited, so will report in more detail in a future update to this post. So there we have it – chamber concerts in lovely locations pretty much every day of the week, and plenty of places for a quick or slow lunch afterwards. I hope that some of you may one day take an hour or two to enjoy some of these, and discover one of London’s characteristic understated cultural delights.